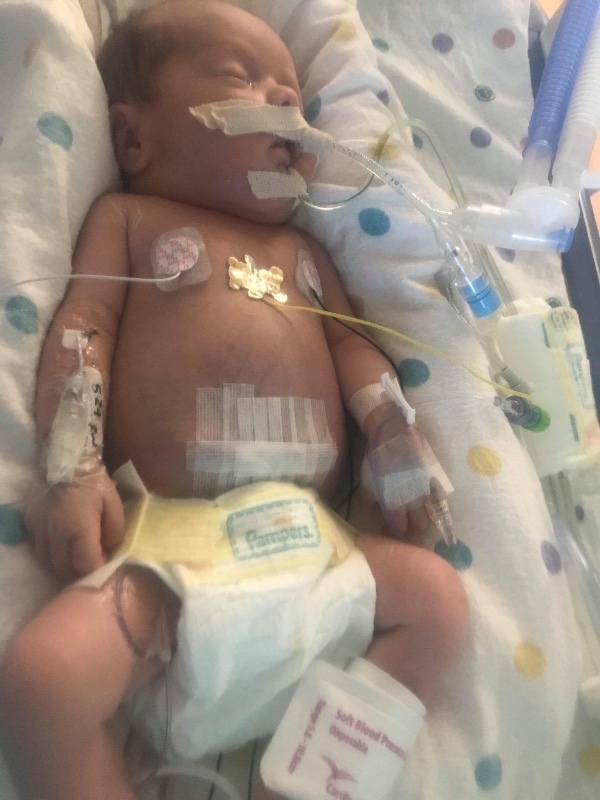 This is my precious Grandson, Kingston...He was born 5 weeks prematurely & on top being a preemie, he also has one of the most severe cases of Gastroschsis, who’s is a medical issue where the baby’s bowels/intestines are on the outside of the baby’s stomach...Where Kingston’s Gastroscesis was 1 of the most severe cases, he had to be rushed to the er within mins. 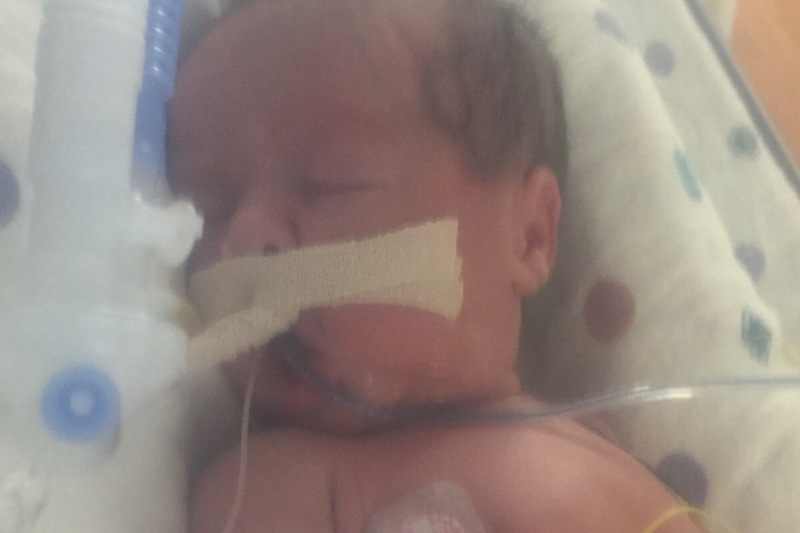 of being born because the opening in his stomach(where the bowls were out) was soo small, that it had cut off blood supply to his bowels, so they had too perform an exploratory surgery to check for damages to the intestines ....Thankfully, they found no damages...This precious little boy has a long road ahead of him! Over the next few weeks, they will take very small amnts. of his bowels & push them back in very slowly. We are unable to hold him right now! We can only touch his hand! Unless you have been through something like this you could never imagine how hard it is as a parent/grandparent to watch their child lay there so sedated that they can’t even open their eyes! My daughter(Kingstons mother) lives with me & her dad along with Kingston’s older siblings, Dawson & Brayleigh, who havent been able to meet their baby brother..Kingston will be at Levine Childrens NICU for the next several weeks, possibly months..My husband is the only one working right & although he has a good job, he has alot of bills that he is responsible for & as an individual that can be tough, as we struggle from paycheck to paycheck as it is! Due to Kingstons medical issues & being born prematurley there was no way anyone could prepare theirselves for what is ahead of us! We knew going into this that my husband could not miss work, especially during this week because our rent was due, our lights are up for disconnection(which we had planned on paying) but unfortunately, my husband ended up missing a day of work, which we knew was going to hurt us but we were just going to pray extra hard that we would find a way to pay our bills but then when he came to pick us up on Tuesday the Dr. decided at the last minute to keep my daughter overnight again due to some swelling in her feet & legs, so not only were we struggling knowing that he had already missed one day & struggling to pay for the gas for the trips that had already been made, he was going to just sleep in the car until the following morning, which unfortunately led to him missing another day of work because of a flat tire! We had no money to buy another one, so we knew missing 2 days of work there was no way that our bills could even come close to being paid! We don’t get food stamps or any kind of assistance, which is 1 of the reasons we struggle but we do what we need to do to get by but Kingston didn’t ask to be born early & he definitely didn’t ask to be born with the medical issue he has! So, I am swallowing my pride enough to ask for a little bit of help! We will be traveling back-and-forth to Charlotte, which is almost 2 hours away from our home to see him, so there will be gas expenses, eating expenses which we will get gas cards but we won’t be getting them until next week & they will be $25 gas cards & I believe she said we could get 2 a month & as everyone knows with gas prices like they are that won’t last any time, although we are beyond appreciative for what we can get at this point! Our car is in desperate need of two back tires & we need to get our rent & lights caught up where we will have a home to bring Kingston to when he’s able to come home! We still need everything for Kingston too, we only have a few of the basics but we still need alot of things like a bed for him, swing, bassinet/vibrating seat, etc. We don’t have a lot but when we have extra money we donate & help local rescues & other organizations & although this is not something I want to do, I feel I’m doing this for Kingston not so much myself! So, please Pray for our family & if possible please donate & know that we appreciate it from the bottom of our Hearts! 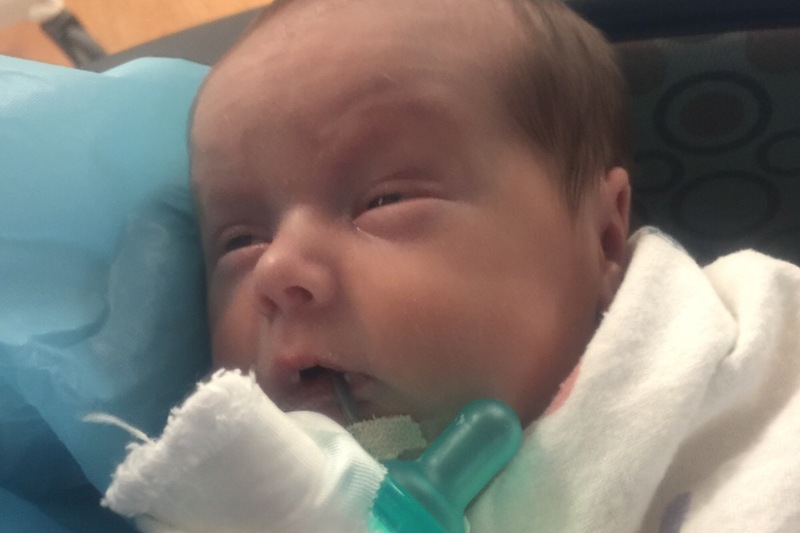 Kingston is now off the ventilator and will begin his feedings tomorrow! We got to hold him for the very 1st time yesterday! He is such a trooper! If everything goes well Kingston should be able to come home in about 3 weeks! The issues are, due to my husband losing days of work, we are now facing eviction unless we can pay what we owe! We still have nothing for baby Kingston, only a few of the basic necessities, so please continue to share so we will have a home to bring this precious little boy home to! God Bless you all! !